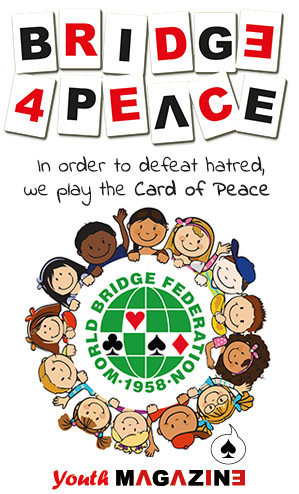 The World Bridge Teams Olympiad, today the World Bridge Games, inaugurated in Turin, Italy in 1960 was the first competition to be set up by the WBF itself, the Bermuda Bowl already being well established when the WBF was founded in 1958. Harold S. Vanderbilt, the inventor of modern bridge scoring, endowed the new event with a handsome cup, the Vanderbilt Trophy. 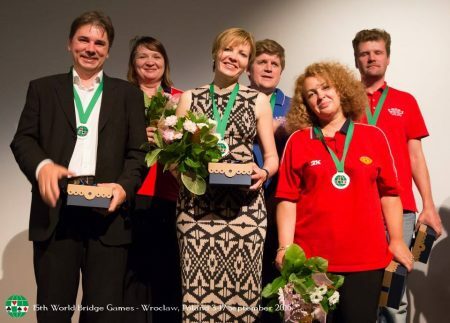 The World Mixed Teams Championship was introduced for the first time in Wroclaw, during the 15th edition of the World Bridge Games. 23 Mixed Teams attended the first edition of the World Mixed Teams Championship. 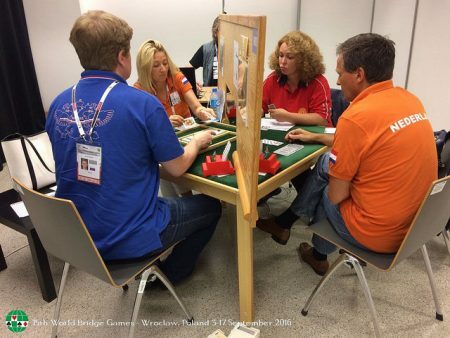 The Netherlands trailed Russia 123-86 with two sets to go but outscored their opponents 97-33 over the final 32 deals to win the first Mixed Teams to be played as a major event at the world championships. 1. 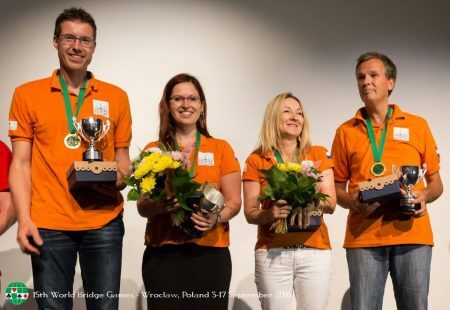 NETHERLANDS: Jan Jansma(pc), Richard Ritmeijer, Aida Jansma, Magdalena Ticha. 2. RUSSIA: Victoria Gromova,Tatiana Ponomareva, Andrey Gromov, Alexander Dubinin, Georgi Matushko, Anna Gulevich. 3. 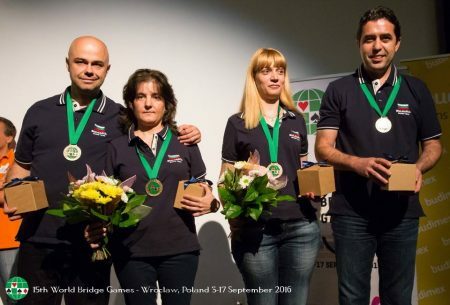 BULGARIA: Ivan Nanev,Victor Aronov (pc), Georgi Karakolev, Miriana Mitovska, Diana Damianova, Marta Nikolova.